The TRAC C-DOMAIN is shown in two different orientations. A C-DOMAIN corresponds to the complete C-REGION, to most of the C-REGION, or to part of the C-REGION, depending on the immunoglobulin or T cell receptor chain type. This figure shows the C-DOMAIN of a alpha chain (PDB: 1bd2_D) of an alpha-delta T cell receptor. Only the C-ALPHA, part of the TRA C-REGION, is displayed. The carbohydrates are not shown. 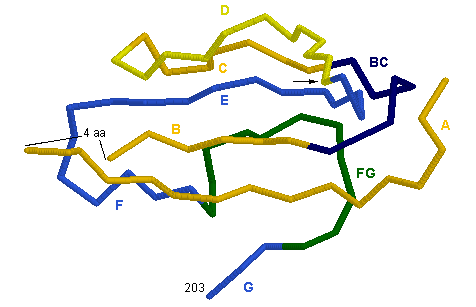 Four amino acids SSDK (positions IMGT 17-20) are missing from the 3D structure of the B strand (shown by "4 aa"). Three other amino acids RSM (positions IMGT 84.5, 84.6, 84.7) are also missing in the 3D structure (shown by a small arrow). This may be due to a confusion between M84.4 and M84.7. In the PDB file, the sequence includes 10 amino acids of the CONNECTING-REGION of the alpha chain, however, the 3D structure only includes C-ALPHA amino acids up to position 203 (according to the IMGT unique numbering for C-DOMAIN and C-LIKE-DOMAIN). The strands C, F and G are on the external face of C-ALPHA. Strands A, B , D and E are on the interface with the C-BETA in the alpha-delta T cell receptor. 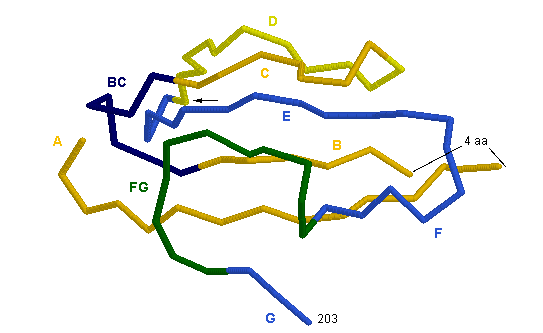 C-DOMAIN strands are colored according to the IMGT color menu for strand representation: A, B and C strands (orange), transversal CD strand (grey), D strand (yellow), E, F, G strands (blue). This image has been generated with the program RASMOL version 2.6  from the PDB file 1bd2 , containing the atomic coordinates of the complexe of a human T cell receptor B7. Sayle, R. and Milner-White, E.J. TIBS, 20, 374 (1995). Ding, Y.H. et al., Immunity, 8, 403-411 (1998).